I Corinthians 13 has been called the Bible’s love chapter. The Bible is filled with descriptions of God’s love in action, and His commands for us to love one another. But it is here in these 13 verses that Paul really defines and describes what Christian love is all about. Paul begins his description with several ‘ifs,’ each describing wonderful abilities or accomplishments. If, he says, I have great spiritual powers, such great faith as to even move mountains; and if, he says, I am very generous and give everything I have to the poor; and even if, he says, I am willing to sacrifice my life; even if I am willing to do all that, if I do not also have love, Paul says, it is all worth nothing and I gain nothing. In the last verse, he says love is the greatest attribute of all. And in between the opening verses, and that concluding verse, Paul describes what Christian love is and does. He uses words like patience and kindness, truth and trust, hope and perseverance. That is what love is like, says Paul, and then he adds a few words about what love is not like. Love does not envy and it does not boast and it is not proud. Love is not rude, not self-seeking, not easily angered, and keeps no record of wrongs. That’s a powerful list, and each word is worth pondering for a while, thinking about how one does or does not fulfill that call to Christian love. But it is a wicked world, and such love is not always returned. So there is one phrase in this chapter I wish Paul would have explained a little more because I’m not sure what he meant. I am not questioning the Bible, and I’m sure Paul could clarify my problem with this otherwise wonderful passage. I’m just saying there is one part I don’t understand. In verse eight Paul says, “Love never fails.” This is where I have the problem. As I said, it is a wicked world, and I see love failing all the time, don’t you? There is love that is not returned, love taken advantage of, love betrayed, love denied, and love rejected. We see love failing all over the place. Jesus himself faced the rejection of the love he wanted to show. That doesn’t mean we stop loving. It certainly did not stop Jesus. Every act of love makes the world a better place, and our Lord commands us to be loving, as He Himself is. 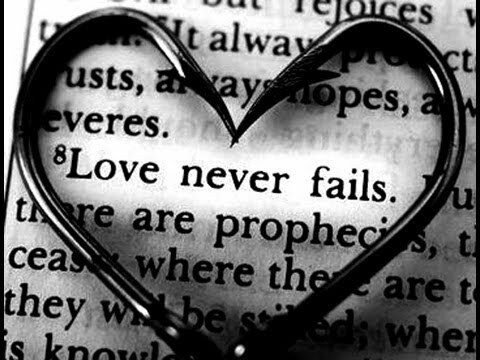 But it does not seem realistic to say love never fails. I am sure Paul would have a good answer to my question. Perhaps he means when both people in a relationship have a love like the love he describes, they cannot fail; or perhaps he means that God in heaven will remember and honor every act of love; or perhaps he means that love in general will not fail to make the world a better place. Any of that could be possible. But he doesn’t say that, and I would like a more complete definition because I am sure every one us can tell of love or good deeds given that did fail to get love or good will in return, and, we can no doubt remember our own failures. Love does fail. Paul isn’t here to clarify this, but I am reminded of a story that was in Guideposts magazine some years ago. It was written by a woman whose children were now grown and on their own. Many years before, early in their marriage, she and her husband were living on the West Coast. He was in the army and they had two small children. About the time that the boys were starting school, the army sent that husband and father to serve in Japan for a year. It was a close family and they were dreading his absence for that long, but they all promised to write back and forth often. The husband did write regularly and his wife and children loved to read the letters. They also always wrote, and all were counting the days until his return.